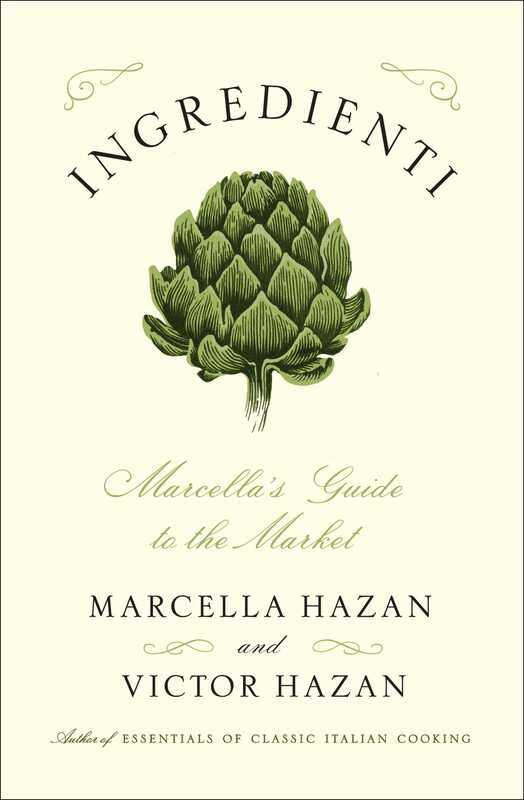 Marcella’s Ingredienti, her final work, will be available in July. Amazon is taking advance orders. You may notice my name on the title page and ask, what is it doing there?Marcella wrote in Italian, in a fast, round hand, leaving no space between lines, filling several legal-size notebooks with her manuscript. Marcella had loved this project and dedicated to it the customary passion with which she worked. It has taken a long while to fortify myself and peruse those pages, to read that familiar hand, but this became the last tribute I could offer, to give her book its English-speaking voice. Marcella’s passion was teaching. She had studied to become a teacher and in her youth she taught mathematics and the biological sciences. Marriage revealed her genius for cooking and, in the latter half of a long life, that is what she taught. She knew this book would be her final opportunity to guide other cooks toward the most desirable choice of ingredients, to share with them her knowledge, her methods and her thoughts in producing what she viewed as one of the richest sources of contentment, good home cooking. Anyone who has cooked with Marcella will recall a phrase that summarized her cooking style, “What you keep out is just as important as what you put in.” There are dishes, of course, that benefit from a copious variety of ingredients. Marcella used to make minestrone for us that could contain a dozen vegetables or more. She packed her books, however, with recipes listing no more than five ingredients, often even less. Her famous tomato sauce that traveled the world has only three. She hoped that the reader would choose ingredients knowingly, visualizing simple dishes within which they could shine. I have worked alone in the kitchen where Marcella had reigned, and I have been testing recipes with many of the ingredients she discusses here. It is remarkable how simple, how direct is her approach, how well it works. Every day of our life that we ate at home, and that accounts for most of our days, Marcella cooked a fresh, satisfying meal. With the knowledge of ingredients that she provides here, good cooks should be capable of using her as their model, to invest the taste of their own cooking with the clarity that is Marcella’s.